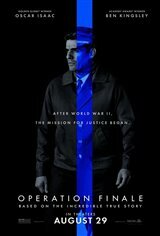 Based on the true story of the 1960 covert mission led by legendary Mossad agent Peter Malkin (Oscar Isaac) and a team of secret agents who searched for notorious Nazi leader Adolf Eichmann (Ben Kingsley), who masterminded the transportation logistics that brought millions of innocent Jews to their deaths in concentration camps. Although Eichmann was reported dead following WWII, they discover him living a quiet life in a suburb of Buenos Aires, Argentina with his wife and children under an assumed name. He works in a factory, but he still has the same views about Jews. They formulate a plan to get him out of Argentina to Israel, so that they can have him stand trial for his crimes, but complications arise at every turn.